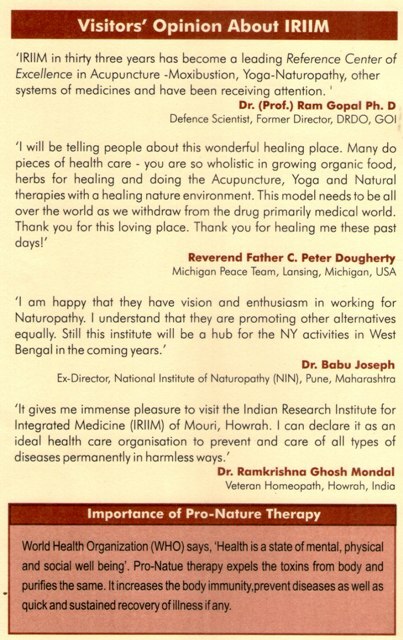 Now we take this opportunity to appeal to you for help & support this Institute without which the noble effort of it would not succeed. Ø To preach the conception behind the practice of IRIIM like organization. Ø To serve the organization as volunteer for a given period with your own skill & expertise. Ø To form a support group in the area where the donor is living, working or in contact. Ø To form a branch of IRIIM activity in any part of India and IRIIM like activity in abroad. Ø To participate in Academic & Research work. Ø To encourage the doctor and non-doctors to undertake training at IRIIM. Ø To help the organization by one time financial aid for the whole project or a part as capita construction or other forms of non-recurring items. Ø To participate Pay for a Day programme. 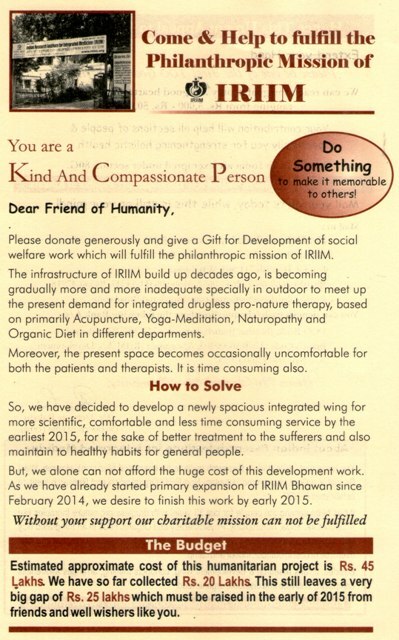 Ø To take responsibility (part or whole) regarding the subsidized treatment and training offered by IRIIM. Ø To help with a variety of used material or equipment or consumables which can be used safely in day-to-day work of IRIIM. 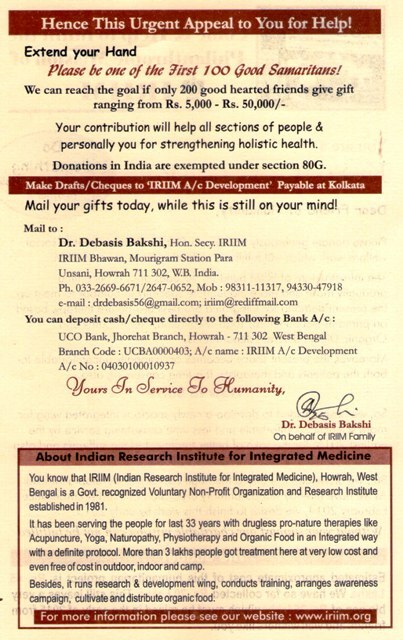 Ø To provide books & periodical, journals (new or used) for the benefit of IRIIM facultymember, patients and students. Ø To associate yourself in any of the ongoing research projects, by way of participating directly or indirectly by partly funding the project. Ø To adopt one (or more) bed(s) by way of bearing the expenditure of maintenance of the bed (at one time or recurring). Ø To participate in rehabilitation of drug addicts by developing supports groups and/or funding those support groups. Ø To be engaged with all sorts of training, awareness activities of IRIIM directly or indirectly. Ø To develop supporting activities in other geographical areas, where IRIIM can help. Ø To spread the word about IRIIM in known circle, so that like-minded people may take interest and like to participate. ‘IRIIM Bhawan’ Mourigram Station Para, P.O. Unsani, Howrah 711 302, West Bengal, India. Ø All contributions to IRIIM by the Indian taxpayers are exempted from Income tax under Section ’80G’ of Indian Income Tax Act of 1961. Ø IRIIM is also registered under Foreign Contribution Regulation Act (FCRA) of 1976, Ministry of Home Affairs, Govt. 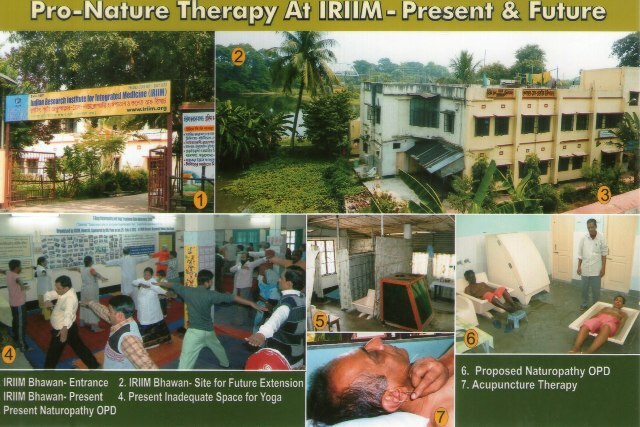 of India enabling IRIIM to receive foreign contribution officially.